San Francisco 49ers quarterback Colin Kaepernick kneeling during the national anthem. I had a good Labor Day weekend. I hope you did too. It was a good respite. Now we should be able to endure the final two months of the presidential campaign. Along with the fall weather, and the days getting shorter, our kids are back at school reading, writing, running, talking, thinking and learning. And, best of all, the Seahawks are gearing up for their first game. 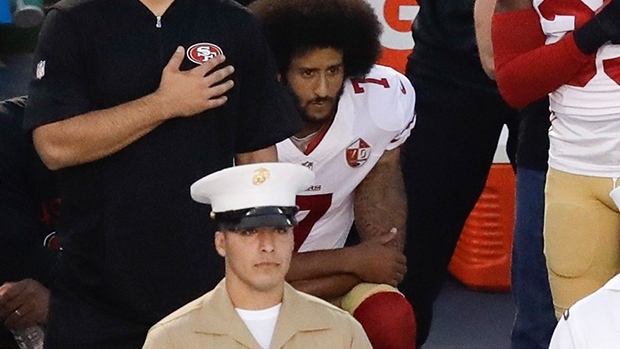 A wrinkle in the game plan for the nation is San Francisco 49ers quarterback Colin Kaepernick’s sit-down protest during the singing of the national anthem. Since his first protest, Megan Rapinoe, a Seattle Reign soccer star, and Jeremy Lane, a Seahawks cornerback, have joined Colin. His protest seeks to draw attention to police brutality and embedded racism in our country. Some people don’t like this. The Santa Clara cops have threatened to refuse to provide security at the 49ers’ football games. So now part of our obsession with football is to see which players sit or kneel to join Kaepernick’s protest and who doesn’t. Between their loved homes and the war’s desolation… . What Key was describing was a land of the free and a home of the brave for white people — the freemen, and a land of the unfree for the enslaved black people of the United States. Key was himself a slave owner and enforcer of slavery. He lived and wrote and practiced law before the Civil War, that is, when America was as much a slavocracy as a democracy. His lyrics are a tribute to the fact that during the War of 1812, the British had hundreds of soldiers who had fled from slavery. They formed three companies of marines, they took part in the burning of Washington, D.C., fought in the Battle of Baltimore, and skirmished against American forces all along the coast. The British commander-in-chief said they were “infinitely more dreaded by the Americans than the British troops.” During the war, between 4,000 and 5,000 slaves fled to British lines and to freedom. The Americans wanted their “property” back. The British refused, transporting ex-slaves to settlement in Canada and Trinidad. Colin’s protest forces us to discuss police brutality and embedded racism. Its roots are embedded in the national anthem itself. The words of “The Star-Spangled Banner” provide the historical context for today’s racism and discrimination, and the actions of slaves fleeing their enslavers to British lines provide us with a very American striving for freedom. Makes you wonder what is patriotic and what is not…. If this verse replaced the third and fourth verses of Key’s lyrics, we would have a national anthem that truly embraced freedom for all people in our country. But with the ode to slavery embedded in the original words, it makes you wonder why we should stand at attention, or even sing, this anthem. It’s a good thing that Kaepernick has started the protest. Should Washington taxpayers pay $1.7 million dollars to create one job?